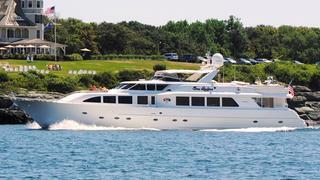 Jonathan Chapman at Northrop & Johnson tells me of a $100,000 price drop on his central listing, the 34m motor yacht Sea Loafers III. A Westport 112 built in 2000 and refitted in 2010, she accommodates eight guests in a master suite, two double staterooms and a twin cabin. With low hours on her engines, many recent major updates, and all servicing up to date, Sea Loafers III is ready for immediate private or charter use by a new owner. Located in West Palm Beach, Florida, Sea Loafers III is down from $3,975,000 to $3,875,000.